Stay informed about relevant hot topics and technology solutions. 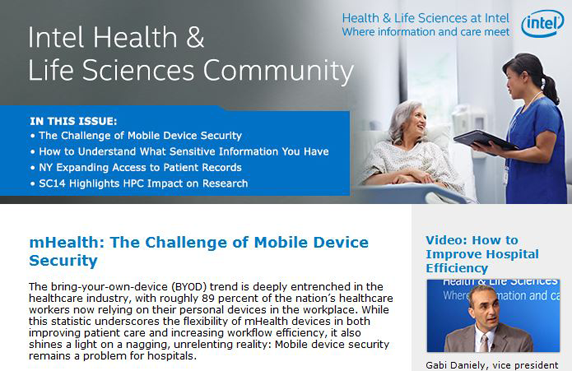 Sign up to receive communications from Intel on health and life sciences technology advancements. Join industry IT professionals, clinicians, and administrators as we examine key issues in health IT, such as data security, cloud, mobility, bioIT, interoperability, and patient empowerment. Get the information you need to help improve patient outcomes—delivered to your inbox. By providing your contact information and clicking submit, you authorize Intel to contact you by email. Intel is committed to protecting your privacy, please review the Intel privacy and cookie notices.